We love them but I have not been able to find them on the Gold Coast for nearly 12 months. 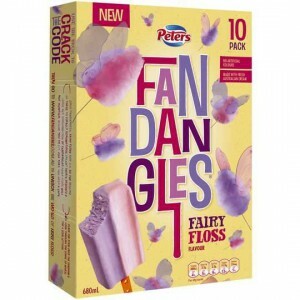 Peters Fandangles ice cream is a good treat for the young ones to enjoy on a Summer’s day,the fairy floss flavour is good flavour and different as well. This beautiful ice cream is soft in texture fluffy taste just like fairy floss and leaves a reminder every time you go shopping to purchase another box. This is a hit in my house hold. The kids and the adults really like it. My kids often ask for it as a treat! The kids didn’t love these ice creams they were very sweet and the youngest two only really ate half. I also noticed how soft they were, they didn’t really seem to hold together for long and we had ice cream everywhere. I probably wouldn’t buy these again. Love the colours of this icecream. It’s not sweet sickly tasting, more of a gentle fairy floss flavour. It’s one of my daughters favourite icreams. How would you rate Peters Fandangles Ice Cream Fairy Floss?